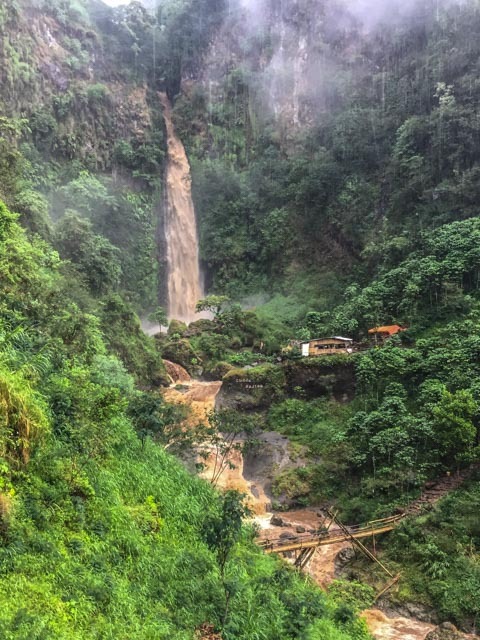 This is the second of a three-part account of a recent short trip to Tana Toraja. Situated in the highlands of central Sulawesi, it is a land of breathtaking beauty, rugged landscapes and and a unique culture that embraces death, bloody sacrifices and all the things about life than that sanitised urbanites have lost touch with. 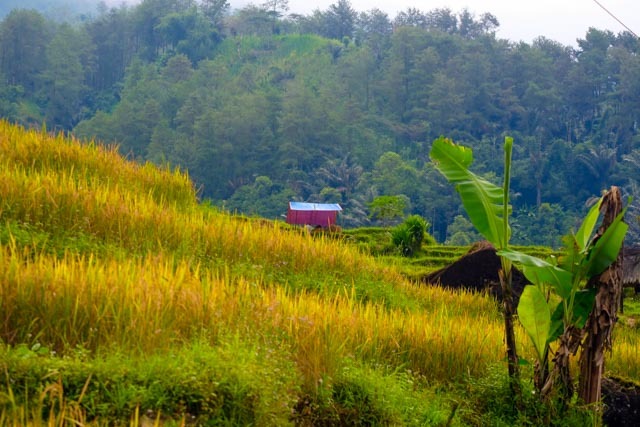 The title of this post comes from the phrase Toraja Melo, which in Torajanese means Toraja the Beautiful. What makes Toraja so alive in the minds of many tourists is Death. Toraja has always been known for its mummies, the ease in which the living live with the dead and its elaborate and bloody funerals. Its death rites are so well known that Toraja was featured in a recent Netflix documentary on destinations with a touch of the macabre, Dark Tourist. In an episode focusing on Southeast Asia the documentary featured the cleansing of a mummy as well as funeral rites of Toraja, the latter of which we got to witness first hand. We were a group of 8 adults and a 6-year old. Our first encounter with the Trojanese attitude toward Death took place during a seemingly innocuous walk after we arrived at our host’s house at Batutumonga, in the heart of Tana Toraja. Our host was Dinny Jusuf. She was born in Pekalongan but she fell in love with Toraja and a Torajanese, Danny, who’s clan was from the Batutumonga area. They eventually got married and these days Dinny runs Toraja Melo, a social enterprise that aims to help and empower the weavers and villagers of Toraja. After we had arrived and rested, we took a walk around Dinny and Danny’s home, a beautiful three-roomed concrete and timber house in Batutumonga, deep in the Toraja highlands. During the walk, Dinny told us about the re-burial of her father-in-law. Her father-in-law had married into a family from the valley from a kingdom called Sa’ Dan. He was buried there when he died some years ago. Dinny, however, kept having dreams where her father-in-law told her that he wanted to be buried at Batutumonga among his family and clan. 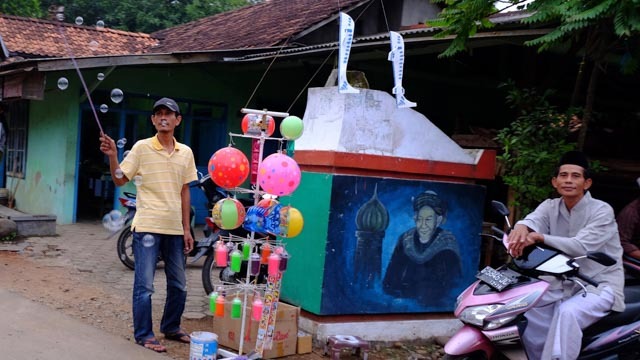 After some negotiations (lots of that go on in Toraja as consensus building is a major part of how the society works), the Sa’Dan family consented to the family moving his remains. A Rock Whisperer was called in. These are shaman-like figures who are able to “ask” the selected rock if it is willing to be opened to accommodate a crypt. The rock consented, but it named a price. It wanted a dog sacrificed before they could start chiseling out the entrance to the grave. Once they had opened up the entrance there would be another consultation with the rock and another sacrifice demanded. And on an on it went. That grave cost six dogs their lives. When the grave was completed they transferred the remains of her father-in-law there. Several years later, his daughter died and was also interred in the same grave. Torajanese graves can be quite large. The next morning we walked to the Suloara village where we saw several Tongkonan and Alang belonging to the clan. We were allowed to go into one of the Tongkonan. Inside, there was a central area with a fireplace. Then there were two rooms, one to the front and the other to the back. These are where the family slept. Our guide told us that often the embalmed bodies of their relatives were kept in the back room. As funerals in Toraja can be very expensive, families have been known to keep these bodies for years until they can afford to hold one. Some families, our guide told us, have kept a body in the back room for as long as 40 years. In the meantime, the family carry on their lives normally, including sleeping in the same room as the mummified body. The Torajanese believe that the body, when embalmed by experts, would not decay or smell. There must be a huge amount of truth to this if they can sleep with the bodies for 40 years. We did not get to see the mummies that they apparently bring out each year for a bit of spring cleaning, before wrapping them up again, putting them back in their coffins and into the graves for another year. Apparently this year that ritual takes place on August 20. There is footage of this in Netflix’s Dark Tourist. It’s macabre, but tourists virtually live for Death to come calling in Toraja. That’s because of the elaborate and sanguine funerals of the Torajanese. When someone dies, and the family can afford it, they throw a huge funeral party of hundreds from neighbouring clans. Makeshift bamboo shelters are put up to house the neighbouring clans. In the funeral we went to, at Palawa, it looked like an organised affair. On the way to the common area of the village we saw men with blowtorches burning the bristles off the skins of slaughtered pigs. They then proceeded to carved them into small pieces to be distributed to the visiting clans. Then there were the buffalo tethered in the central area. Most of the buffalo were black. The black ones were the hoi polloi of buffalo but still fetched something like Rp 5 mio each. Then there are the albino ones that usually have black spots or patches. These are the, if you’ll excuse the pun, Brahmin of buffalo. 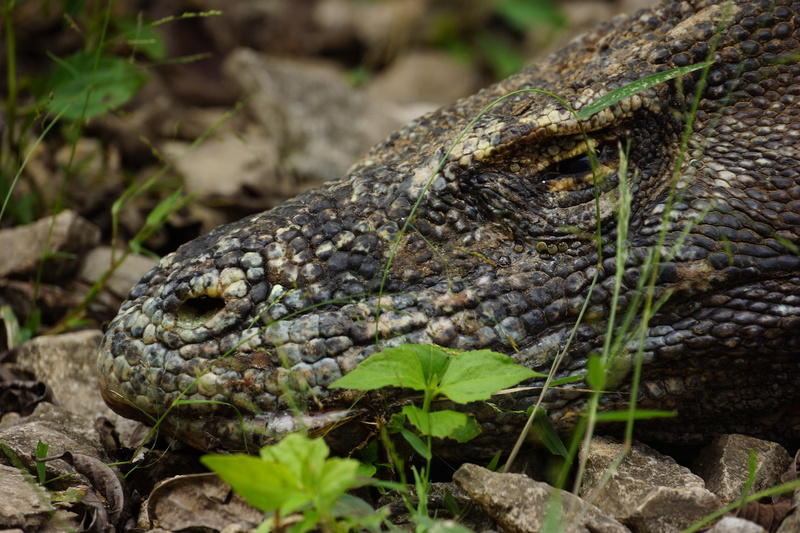 They are prestigious because of their relative rarity allows them to command a price of over Rp250 million per animal. Pink is the new black. The albino buffalo with patches of black are prized over the ordinarily black buffalo and gives the donor a higher status in Torajanese society. The buffalo and pigs are donated by visiting clans as a sign of respect to the family. These animals, after slaughter, are supposed to carry the deceased to the afterlife. The gifting of buffaloes are all tallied up by the families, who never forget a debt. When the donor’s clan leader dies the receiving clan is expected to reciprocate by donating the same amount of buffalo or pigs to redeem their debt. In this way, the society is bound together in a web of obligations. It also locks them into a cycle of poverty trying to square their debts as clans may have to donate up to 24 buffalo each. The visiting clans were allocated their own areas, all numbered, in makeshift shelters. It was ironical to see the decorative pennants and numbers of the shelters being sponsored by a purveyor of death, the cigarette brand, LA Bold. Clans get an allocated space in makeshift shelters. Notice the LA Bold branding in the funeral decorations. The more socially established clans got spaces under the Alang or Tonkonan. All over the compound you can see traces of animal parts or blood. When we arrived there were a group of about 30 men gathered in a circle chanting. Apparently this is a rite after the body has been put into the coffin, which is shaped like a tear-shaped cylinder. Each of the men received a cigarette each for their participation. Then there was a troupe of dancing girls who performed in front of guests seated at a makeshift cluster of platforms in the centre of the compound. When they finished the audience would drop money into a basket that is covered by a cloth to hide the amount donated. There was activity everywhere. Buffalo were being led here and there. Pigs were trussed and left to lie in the hot sun until their time came when men with spray cans would mark them up and they, squealing, were taken to slaughter by a group of workers. Marked pigs are then taken away for slaughter. I did not see it, but one of our group, who was in the best of times was queasy with the sight of blood, had to pick her way through a wasteland of remains and blood on her way to the toilet. Being accompanied by a local she found it difficult to say she would not go and had to run the gauntlet of gore. We felt uncomfortable with the treatment of the animals but we were also aware that city slickers like ourselves were so sanitised from the taking of life for food; and so removed from Torajan culture that it would be unfair for us to impose our values on them. One of our group remarked that the killing was part and parcel of Torajan culture and you cannot separate it from the other more appealing cultural aspects. We left the funeral wondering if we should turn vegetarian. One of the most well-known grave sites in Tana Toraja is Loko’Mata, which is a gigantic granite boulder riddled with more than 20 grave chambers, spread roughly over five levels. The higher the level the higher the status of the departed when they were alive. At the base of the rock are miniature Tongkonan that were used to carry the coffins to the area. Each of the graves had a carved door decorated with traditional Torjanese motifs. Photos and portraits of the departed were hung on them. You can also see bottles of water, Sprite and other foodstuff put on the entrance of the graves as offerings to the dead. Graves have carved wooden doors with a portrait of the deceased. All the graves belong to a single clan. The rock has apparently been used for two to three hundred years but at the side of the boulder away from the road, another grave was being opened on the rock. The graves at Loko’Mata also had some Tau Tau, effigies of the dead. One had a buffalo head carved into the rock. The gravesite, however, that is most well-known for its Tau Tau is Lemo. The graves there date back to the 16th century and are dug into a limestone cliff. There you can see rows of Tau Tau looking down at you and the valley. The Tau Tau are life-like and are carved by the artisans in that village who have been plying their trade for hundreds of years. There is a shop near the base of the cliff whose owner carves Tau Tau. At the back of the shop I saw with the corner of my eye two women, one young and another old, sitting on a bench, seemingly holding hands. It was when I looked more carefully that I realise that the old woman was a Tau Tau. The young woman seemed at ease sitting together with her. I was spooked. We also visited Ke’te’ Kesu’. The village was declared a UNESCO World Heritage site that is known for its well -reserved Tongkonan, as well as its hanging coffins. Unlike recently built ones, the roofs of the Tongkonan at at Ke’te’ Kesu’ were made from bamboo, the original material for their distinctive roofs. 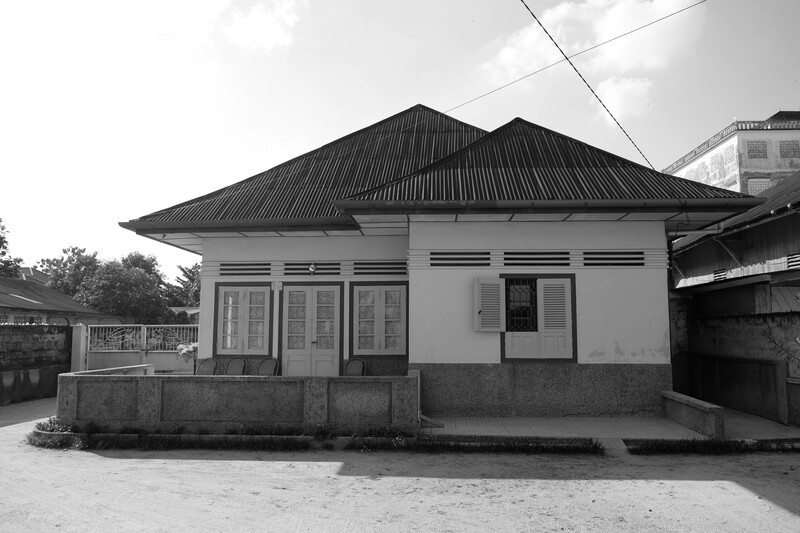 These days Tongkonan are built with corrugated zinc roofs. Ke’te’Kesu’s Tongkonan have roofs made of bamboo, unlike more modern constructions that use corrugated zinc roofs. What was even more fascinating about Ke’te’ Kesu’, however, were the hanging coffins on the limestone cliffs behind the village. Walk up a flight of stairs and you will see finely carved coffins hundreds of years old in various states of decay. Some are propped up on timber poles high up in the cliff. Others are clustered at the base of the cliff. They might have fallen down when their supports decayed. Some of these coffins are split open, others had gaping holes. Inside and on top of these coffins are stacked human skulls and bones. A particularly beautiful coffin was carved in the shape of a buffalo head. As they are just beside the cemented path that visitors use, and are unguarded, they are vulnerable to vandalism and theft. Apparently, a few days before there was much hue and cry from the locals when some Indonesians from out of town, to satisfy their Instagram urges, began to take photographs with their legs on skulls. That about sums up our experience with deaths, funerals and graves for this trip. Coming up next – Toraja is indeed Melo III: Buffalo Market and a night of Torajanese culture, food and the local fire water – balloc. 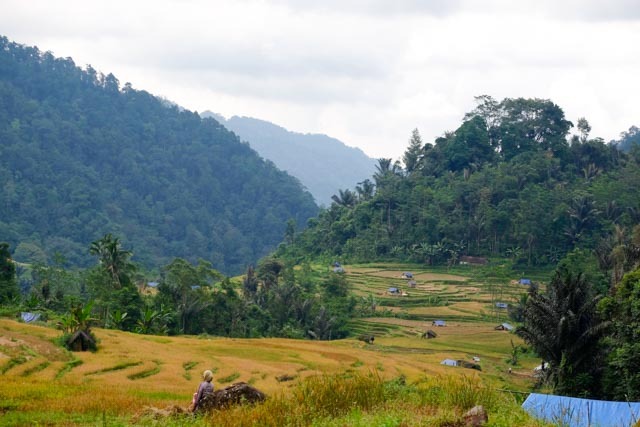 Petungkriyono is a forest reserve about three hours drive south of Pekalongan in Central Java. The distance is not that great but like many other places the road there is narrow and potholed, prolonging the journey that would take about a third of the time if it was serviced by good roads. It’s actually adjacent to the better known Dieng Plateau, so the vegetation there is thick, the weather when we were there in July wet and fairly cool. The area is about 7,000 hectares and houses several villages. 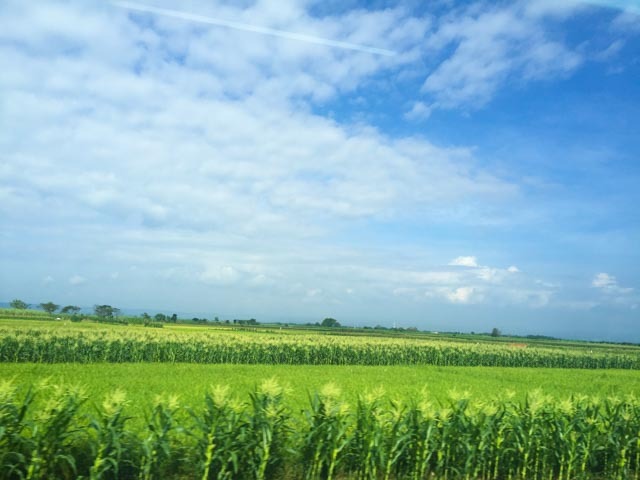 The Pekalongan government is trying to turn this area into a tourist destination. This means that if you love nature, go there before things get spoilt. The main attraction, apart from the flora and fauna seems to be the Welo River where you can go river tubing. The concept sounds more attractive and fun than it actually is. A group of us tried it and we were taken to a part of the river where we were to begin our journey. We were given helmets, arm pads and knee pads that looked like arm pads. We then got on rubber tubes and off we went shooting the rapids – for about 20 meters. Then we had to disembark, get off and walk to the next stretch where we would get a 10 or 15 meter ride down the tube. It was a bit dangerous. We had to walk and jump from one section to another barefoot and the tubes are anything but stable so overturning in tricky sections were inevitable. The organisers were all well meaning and caring but their idea of safety isn’t the highest by international standards so you could imagine if someone overturned and, in a panic, kept holding on to the tube. They would have been dragged by the strong current. Once when I overturned I hit my head against a rock. Luckily I had a helmet, and a hard head. Still, it ended well and it was fun although I’d not recommend it for the less intrepid. 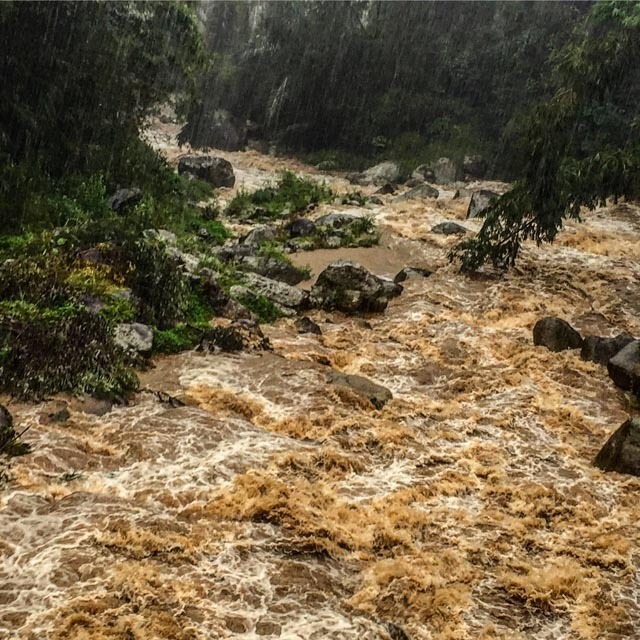 Other than that the best part of the trip was to wind down the car windows and enjoy the scenery as we passed by rice terraces cut into the hills, rivers swollen and angry from the recent rains. The other attractions included watching the power of the river expressing itself as a raging waterfall at Curug Bajing (Squirrel’s Waterfall). Leaving Petungkriyono you get to pass through small towns with their market days. Had a spare day after a business trip to Munich in July so took the train to Dachau, the Nazi’s first concentration camp located about 10km outside of the city. It was opened in 1933 by Heinrich Himmler and meant to house political prisoners but quickly became a catch all for everyone the Nazis couldn’t tolerate – Jews, monosexuals, foreigners, even German and Austrian criminals. There must have been so much sorrow and sadness played out there but when I visited I found the place impeccably restored but clinical, like so much of Bavaria. It did not help that it was a beautiful day. The sun was shining, it was cool and cottony clouds floated across the blue sky. I could not help wondering what the inmates must have thought, the irony they savoured, on such a beautiful day when imprisoned in Dachau, a place specially designed to strip them of their dignity. The iron gate into Dachau with the slogan “Work Will Set You Free”. The Nazis excelled in mocking and insulting their prisoners. Another irony. While stripping the wall of paint, the restorers found the original paintwork where a “no smoking sign” was prominently painted on the wall. Many of the prisoners would be killed within a short time so this admonition seemed pointless and mocking. This is where the prisoners were brought en masse to shower. 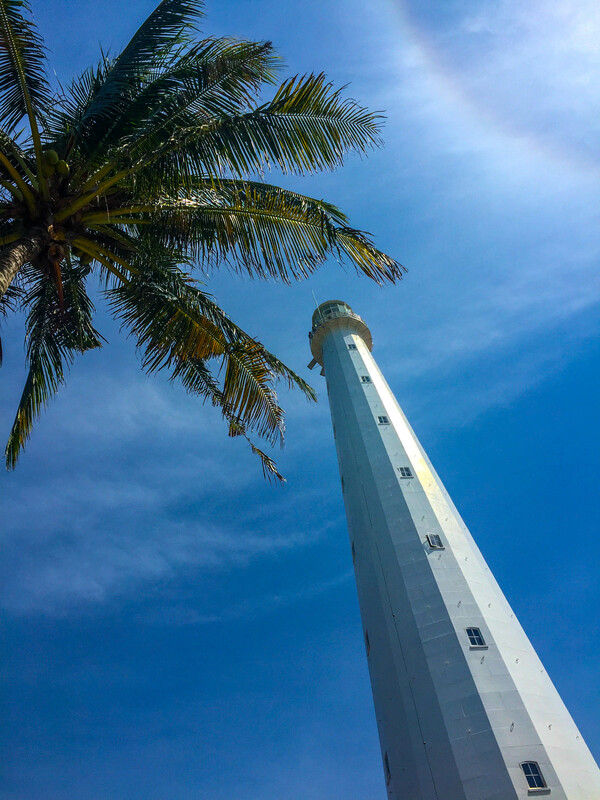 Our office recently went on an outing to Belitung, an island off the east coast of South Sumatra made famous by the film Laska Pelangi. 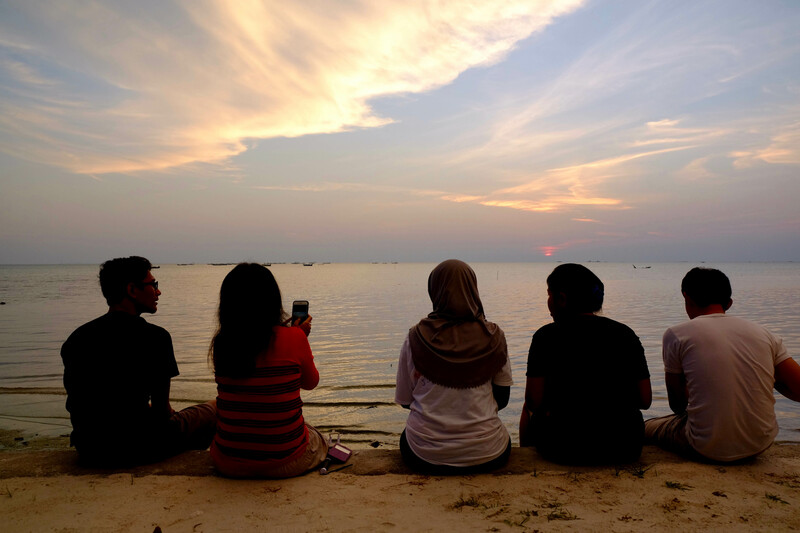 Our first stop was Tanjung Pandang Beach, a recreational stretch that had nothing remarkable except that it faced west and therefore was a place to watch the sunset. 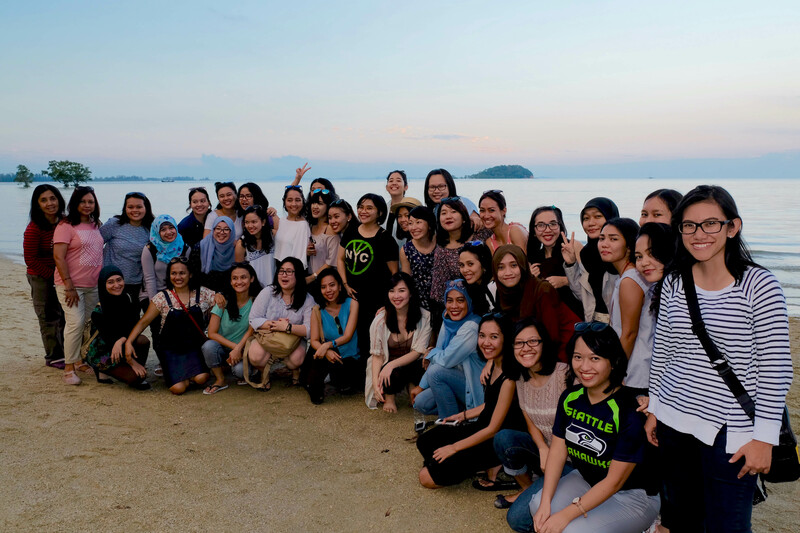 So we did what all good Indonesian groups do, which is to take lots of group photos and selfies. There was also the “it’s good to be Boss photo” designed to show me up as a beacon of collected calm in a sea of jumping staff members. Others ventured to become amateur photographers and models for their portfolios and Instagram accounts. 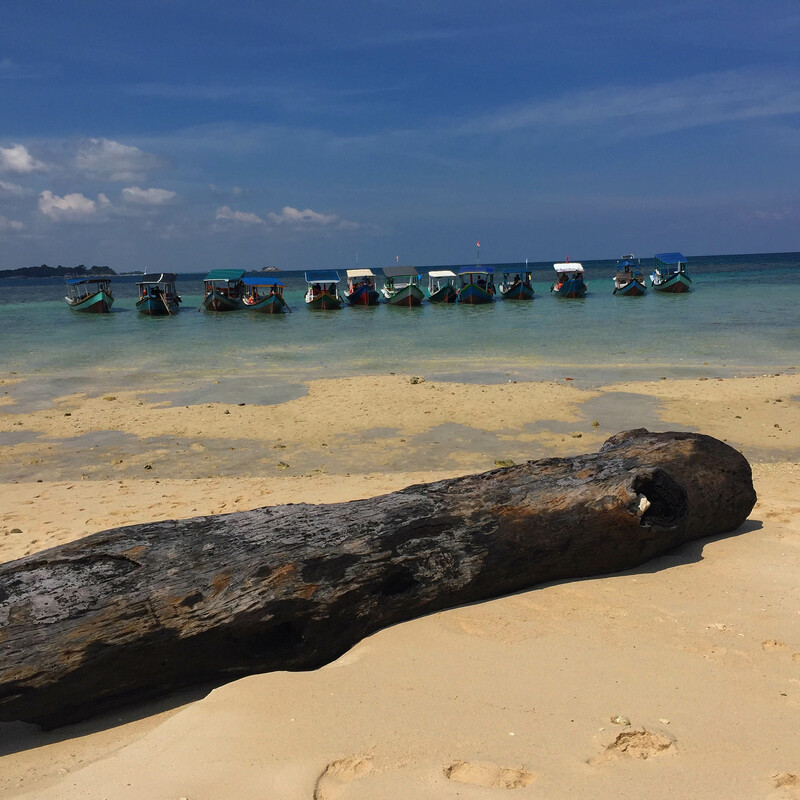 The next day was games day where we went on boats to the surrounding islands, mainly Pulau Lengkuas. 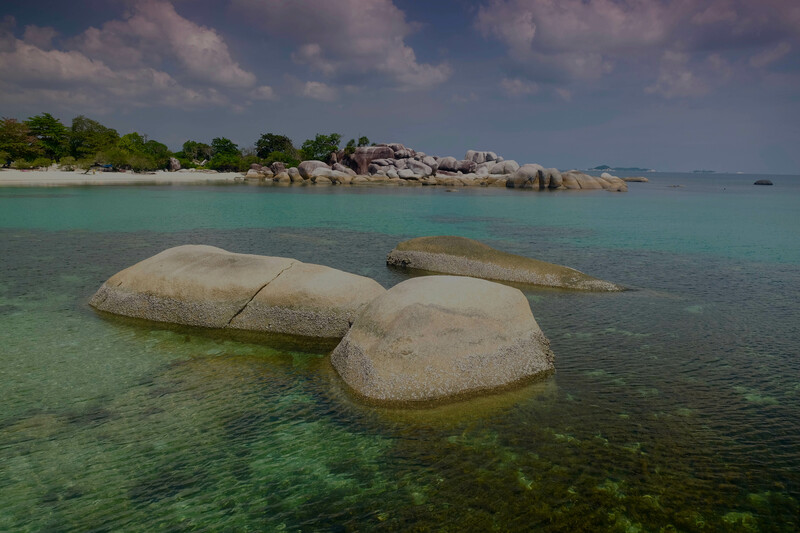 They all had the characteristic of having huge rocks sitting on white sand or clear sea. The island was, however, beautiful. 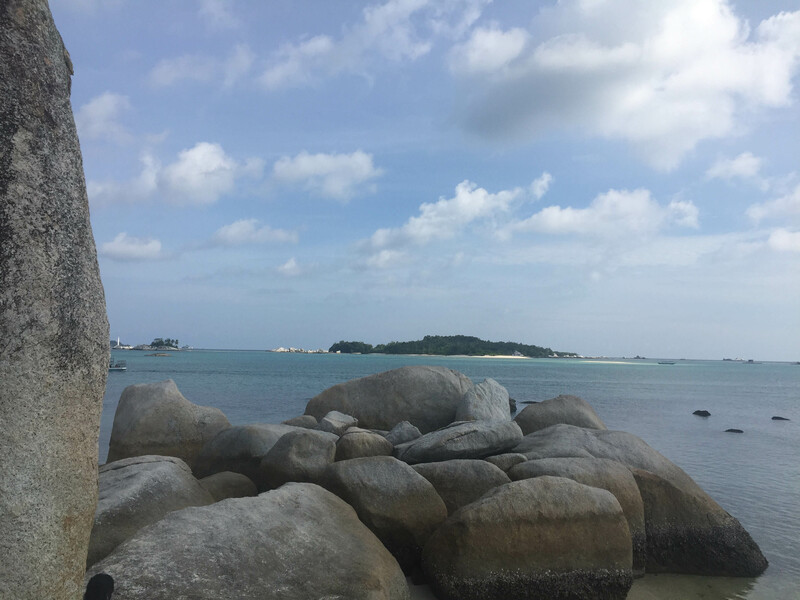 In between the games and activities we had we managed to see a bit of Belitung, which is on the surface a rather dull town with unremarkable modern buildings that belie its rich tin-mining past. Or this colonial building that the neighbours couldn’t tell what it was built for. 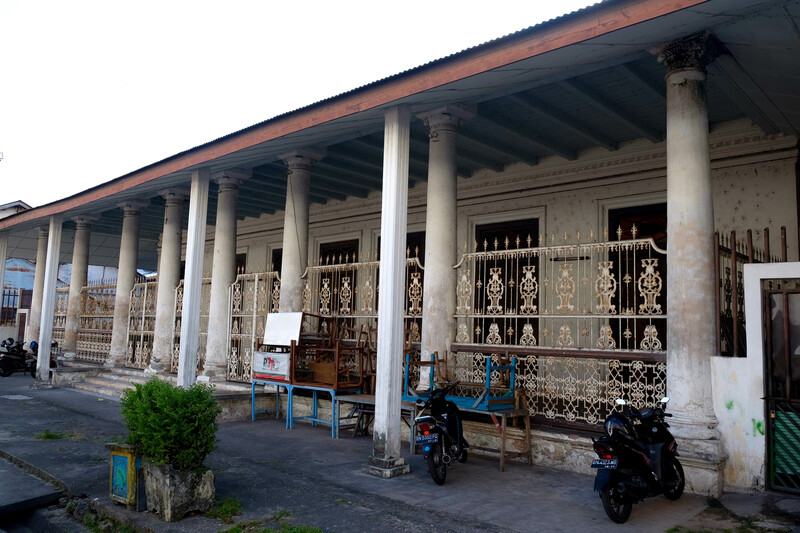 There was also a temple, the Hock Tek Che temple near the market that hinted on the Chinese ethnic groups that coalesced around mining towns in Indonesia and Malaysia. Apparently the largest groups are the Hakkas, the Haines and the Hokkiens. 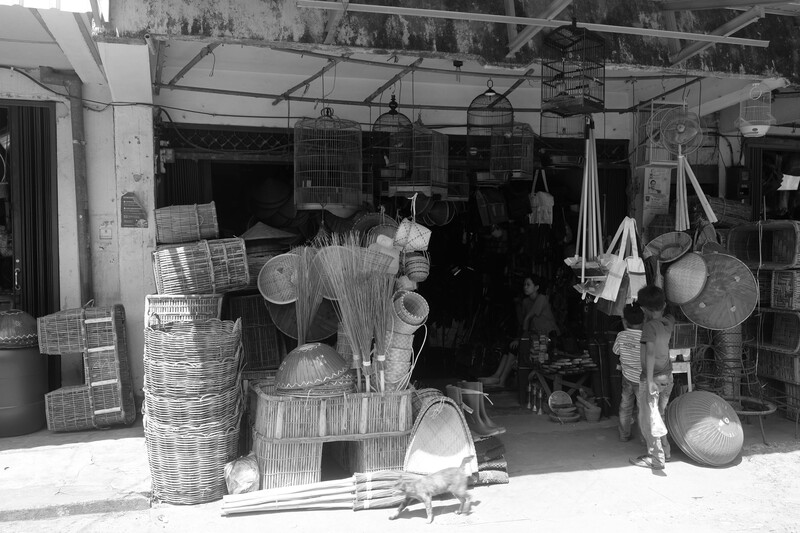 There were also a few shops, again near the market, that echoes traditional trades of the Straits Chinese like this rattan shop. There was also little recreation in the town. No cinemas or Karaokes that we should see, a small shopping mall that you covered in 10 minutes. Much of the entertainment seemed to centre around drinking coffee at the beach and at coffee shops. Among the coffee shops Kong Djie stands out as the top hang out spot. There are three outlets, one by the beach, a relatively hip one near a restaurant and ole-olen complex and the original one in town. 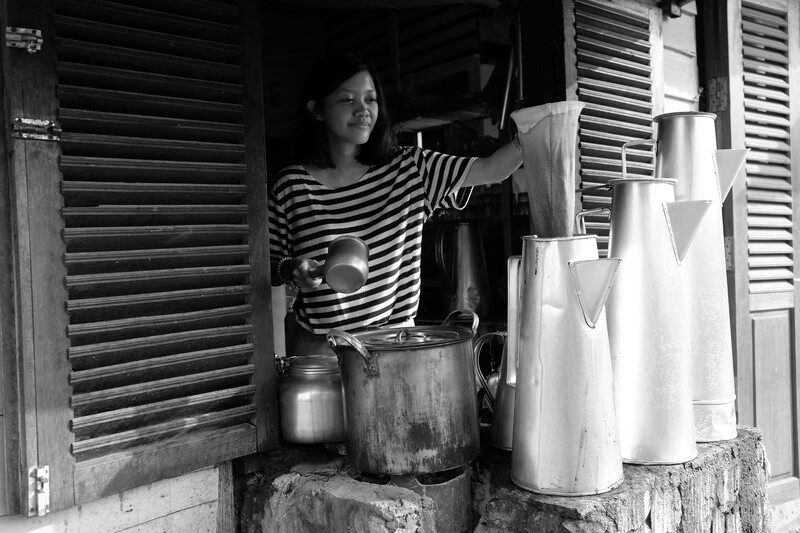 When we were there Isyak, the sen of the founder was minding the till and occasionally making the coffee. He’s a sport though and allowed one of our colleagues to play barista for the afternoon. Back at our hotel, called the Bahamas Resort (why do they name one exotic tropical beach destination with another) it was time to chill out and bond as an office. 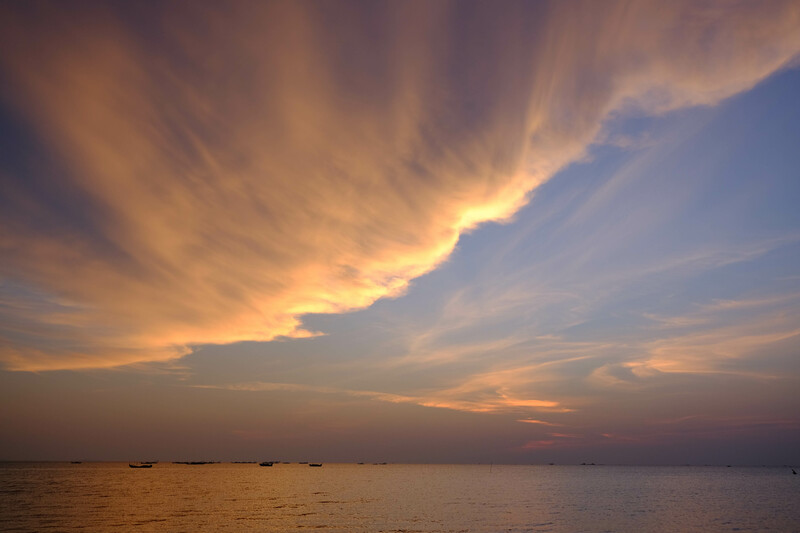 We were treated to the great sunsets Belitung offers. 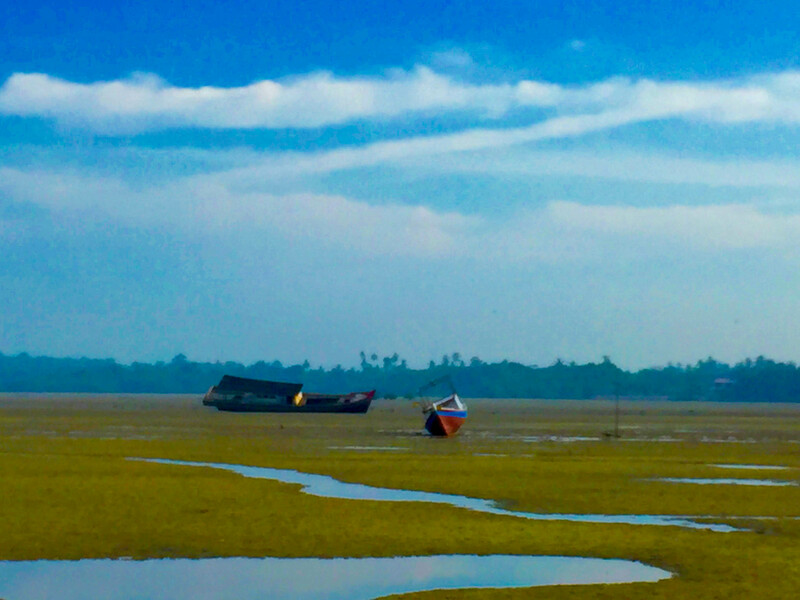 The scene changed with the tide went out. 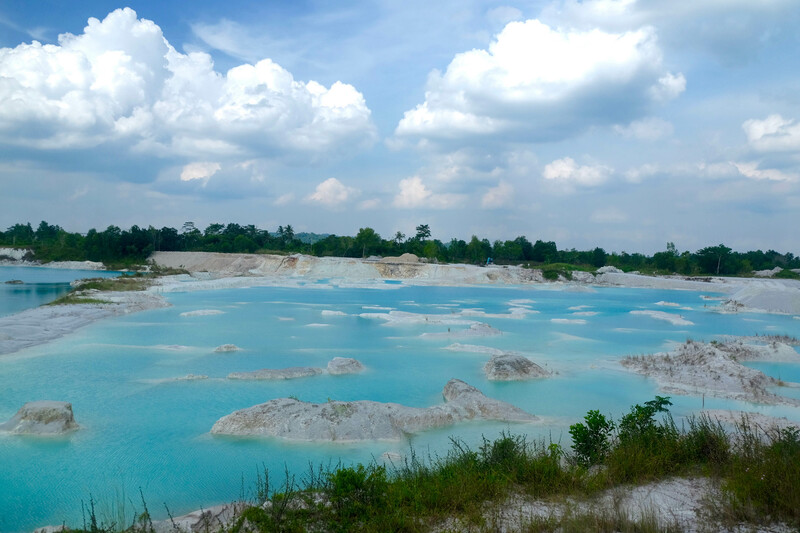 Two other attractions that Belitung has is the Blue Lake, so called because the kaolin mined in the depleted time mine has given the water a bluish tint. And of course, there was the famous beach (I forgot the name) where Laskar Pelangi was shot, still. clear waters punctuated by time rounded boulders. 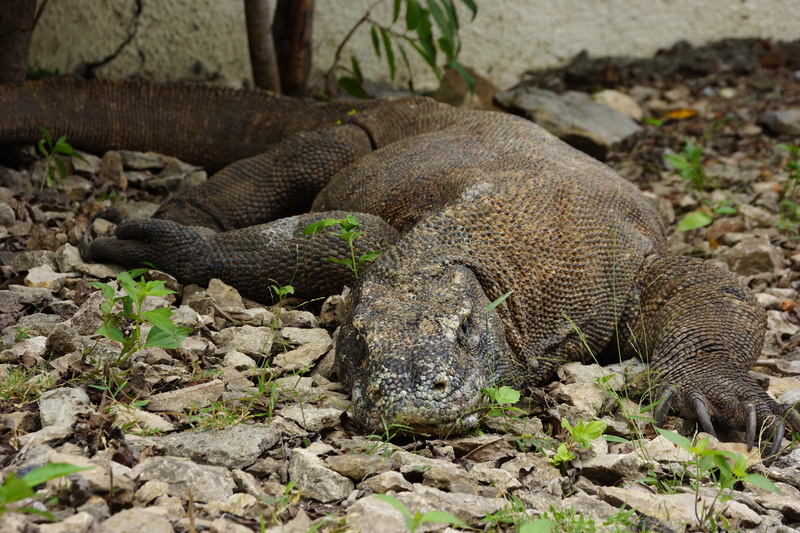 The Komodo Dragon is one awe-inspiring creature, quite terrifying when you get near. Even when it is ostentatiously asleep you’ll never be sure what will happen if it decides to wake up or get pissed off. How well does Jakarta do when it comes to location branding (a fancy modern word to substitute for reputation of a place)? 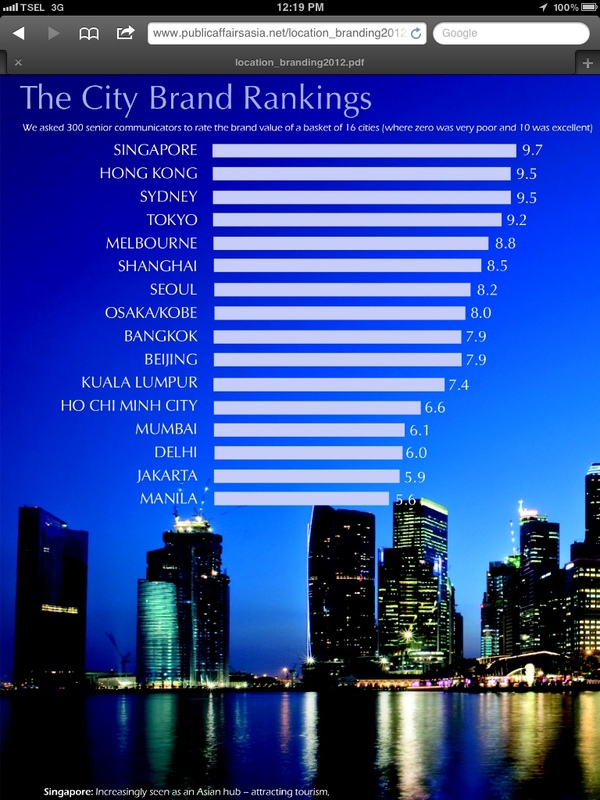 According to a study by Public Affairs Asia and Ogilvy PR called Location Branding 2012, not that well at all. Out of 16 cities Jakarta came 14, just above Manila. Another dubious distinction for this city. perhaps it is time for its residents to sport more checked shirts to get the city going.